It is not everyday that you get to see a big-time celebrity like Will.I.Am use his BlackBerry in a real-life situation. Just the other day, during the performance of a song on French television with Belgian artist Stromae, the Black Eyed Peas frontman couldn't remember the lyrics. Did he panic? Did he mumble some made-up words? 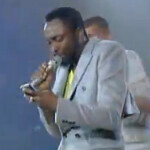 No, he calmly reached into his pocket and pulled out his BlackBerry Torch to find the words to the song. After the tune was over, the singer told an interviewer that this was the first time that he had performed the song and didn't know the lyrics that well. As for using a BlackBerry to read the lyrics, remember, this is a group that had a music video with the BlackBerry PlayBook in it before the tablet was even released. If you cared to look, the screen on a lot of Blackberries are better than some Android phones. The Torch gets the Black Eyed Peas, the iPhone gets the freaking space shuttle. Not a lot of justice there. BB is dead. Go get Android instead. You mean that the BEPs had the Playbook in a video before it was even made official.